As a full laptop-replacement the Acer Switch Alpha 12 ticks many of the right boxes. The integrated stand is solid, the silent operation from the LiquidLoop cooling system is an obvious benefit, there’s as much power on hand as a Microsoft Surface Pro 4, ample screen brightness and resolution, while the keyboard dock and stylus are both included in the box (in the UK). The laptop-replacement market is going from strength to strength, with every manufacturer worth its salt looking to innovate in the 2-in-1 market and stand apart from the top-of-the-pack Microsoft Surface. With the Acer Switch Alpha 12, the Taiwanese company's bet is on liquid cooling, affordability, and a full laptop-like experience straight out of the box. That's perhaps what we like most about the Switch Alpha 12: for £600 you get both a clip-on keyboard dock and stylus included in the one box (in the UK at least, the stylus isn't included in all regions), which helps it stand apart from the Huawei MateBook, iPad Pro and, to some extent, Samsung Galaxy TabPro S too. At that price, though, are there corners being cut for the sake of affordability? Not precisely. If you want more power then Intel Core i5 and Core i7 models join the ranks at £750 and £950 respectively. We've been handling the entry-level Core i3 model to see how well it holds up. Now Acer isn't best known for always using luxe materials in its designs, but the Alpha tries to show its a-list quality with a brushed metal back plate. Problem is, it doesn't really look metal, more faux, because the surrounding trim and integrated kickstand are made of different material, with a different finish. So while the back section is glossy and reflective, the matte finish of the stand makes the two parts look like they've been mis-matched. If that's its weakness, however, then the Switch Alpha 12 asserts strength with its integrated kickstand design. Its sometimes a fuss to pull out without looking at what you're doing, but it's seamlessly merged into the design of the main unit, and importantly can be angled between almost any given angle - from around 30-degrees to 150-degrees for an approaching flat position. Where so many other manufacturers have failed is to integrate a flexible stand such as this: Samsung, Huawei, Apple all have fussy stands with two or three pre-fixed positions. So hats off to Acer here, this is a fundamental point that makes using the device as appealing as the Microsoft Surface Pro. There are a decent number of ports, too. Tucked away behind that slender stand is a microSD port to expand on-board storage, but with a 128GB SSD as standard there's ample space to get things going (only the Core i7, £950 version of the Switch Alpha 12 comes with 256GB as standard in the UK). A full-size USB 3 port meets a USB Type-C port, while a separate charging port ensures there's no unnecessary busying of that latter port at any time - unlike many other manufacturers that use the Type-C port for both charger and access. As a tablet design the Switch Alpha 12 is perfectly serviceable, its 12-inch screen sitting into a smaller-than-A4-page measurement (292.1 x 201.4mm), with thumb-tip-size black bezel that's not overbearing, ensuring there's somewhere outside of the screen to hold the device. Acer's website suggests the device is 15.85mm deep, but this is only the case with keyboard dock attached; without it we're measuring around 12mm at its thickest point. Now that's thicker than the 9.5mm claimed at the launch event (April 2016), which is only true if looking side-on and discounting the integrated stand (as its rubber footing protrudes outwards). So, overall, it's not the very slimmest offering out there, but could hardly be accused of being massive either. The fact the Switch Alpha 12 comes with a keyboard included in the box is a massive plus point. It doesn't hold any additional battery power, though, but does easily attaches via the magnetic clips, holds firmly into place and even has backlighting to make typing in the dark all the easier. The typing experience is comfortable, as the keyboard can lay completely flat or be “folded” back on itself for a subtle angle against the main tablet unit, in the same way that the Microsoft Surface allows. The keys have ample travel and their plasticky finish isn't of concern. The trackpad, however, is the cause of some gripes. It's got a really detached feel to its click, which is extra deep towards the forward left/right corners. With the keyboard dock rested on a lap the trackpad can be difficult to navigate accurately. It's not the worst we've used, but it's a far cry from the glass-topped ones you'll find in the best notebooks. Lastly there's the included stylus, or Acer Active Stylus, which looks and feels a lot like a ball-point pen. It comes with an included AAA battery, so there's no need to charge, while the keyboard dock has a material loop for safe keeping. Two buttons on the stylus' side add extra controls. It's a pretty adept little tool, which avoids the larger scale of some competitors' extra-cost options. The stylus is semi-programmable, too, with a double-click of the front button bringing up a hexagonal on-screen menu, called Acer Hover Access (this can be deactivated if you wish). The second button can be used to quick-launch an app, as available from this pop-up menu: OneNote, Sticky Notes, Fresh Paint, Windows Journal and Snipping Tool being the options (these are all embedded Windows applications, simply sourced through Acer's small software addition). 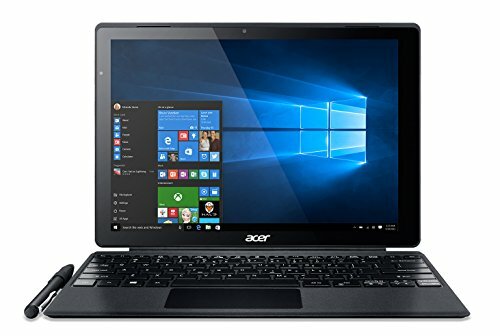 In terms of screen Acer isn't cutting corners. Fingerprint smears aside, the finish is semi-glossy so avoids the worst of reflections, while ample brightness ensures it'll cut through the worst surrounding light to deliver a bright picture. It's not quite as eye-popping as the Surface in this department, but very close. Take one glance at the default Windows desktop background and its saturated green colour looks well overbaked. Fortunately this is an isolated incident, with standard Windows panels looking bright without overdoing saturation. It's not an AMOLED panel, though, instead opting for IPS LCD technology, which delivers decent colour and viewing angles even from acute points of view. Resolution-wise there are plenty of pixels tucked into this 12-inch screen: 2160 x 1440 of them, to be exact (otherwise known as qHD). So there are no worries watching 1080p video at full resolution, or even video editing with space to spare around the sides. We've been dabbling in Photoshop and making the most of this resolution when editing product pictures. With ample thickness to the design we had our fingers crossed that the Switch Alpha 12 would come loaded with a long-life battery. Sadly it's not the greatest out there, giving around 5-hours of use per charge. We lamented that this was the case with the Huawei MateBook and found the Microsoft Surface Pro 4's 6-hour battery life to be surprisingly less than we had expected. So, once again, another maker can't deliver truly laptop-replacement longevity. The combination of screen resolution, brightness and specification all go hand in hand for that result. Recharging is simple enough, though, via the included charger. The cable comes with a fairly large transformer brick on it, which we're not keen on, but it'll re-juice the device in 2-hours and 15-minutes from dead. Of course where the Switch Alpha goes one up on the likes of the Huawei MateBook is that it's shunned Intel Core M for the more powerful Intel Core i arrangement. Here with a 4GB RAM pairing (it's 8GB for i5 and i7 models), the 2.3GHz i3-6100U chip is going to draw more power than Core M. Pound for pound, therefore, the Acer is the favourable product, delivering Surface-like power in the palm of your hand. Indeed there's not much, if anything, between this Acer's performance and Microsoft's champion in its comparable spec. Now, Intel Core i processors need cooling, which usually means a fan is required. And fans mean noise. Not so the Switch Alpha 12: instead it employs Acer LiquidLoop, a closed-loop liquid cooling system. That means no fans, so there's no noise whatsoever - it's silent in operation, which is a huge plus point. Without processor throttling there's inevitably going to be heat produced, but in the Switch Alpha 12 the heat generated by the system triggers the liquid in the cooling system. Some heat is produced, though, so the back of the device can get warm to one side, but nothing too alarming. As a full laptop-replacement the Acer Switch Alpha 12 ticks many of the right boxes. The integrated stand is solid, the silent operation from the LiquidLoop cooling system is an obvious benefit, there's as much power on hand as a Microsoft Surface Pro 4, ample screen brightness and resolution, while the keyboard dock and stylus are both included in the box (in the UK). Sure, it's not as slim or attractive as the Huawei MateBook, plus suffers a similar 5-hours of battery life per charge, but given the comparative bump in power and price point those are partly forgivable issues. And that's the key sell for the Switch Alpha: given it's a complete solution straight out of the box, starting at £600, it's affordability that's well on its side. That's what helps make it a winner.